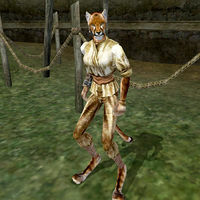 Ahzini is a Khajiit slave working at the Dren Plantation. She was one of five slaves recently purchased by Orvas Dren, and he ordered the plantation foreman Hlevala Madalvel to make sure Ahzini was accounted for so he could mark her as "plantation property" in his personal records. If you have the Dren Plantation Slave Key, you can free her and the other slaves at the plantation. This will help you earn the respect of the Twin Lamps, but will also turn the guards at the plantation hostile. Ahzini wears a slave's right bracer along with a common shirt and matching pants. Like all Khajiit, she can see well in the dark and can demoralize others for short periods, but otherwise knows no spells. This page was last modified on 14 March 2014, at 04:18.